The above ad was placed by Million Air on airnav.com, a website for private aircraft researching which airports and private terminals to use. 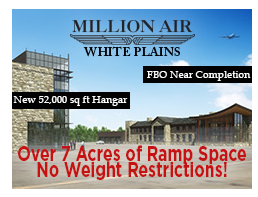 Notably, this ad appears on the page for Teterboro Airport. Teterboro and Westchester Airport are competitors to serve private aircraft whose passengers are going to NYC. However, Teterboro has a 100,000 lb weight restriction that is strictly enforced both by the airport and by the activism of the surrounding community. They know that larger aircraft cause more air, water, and noise pollution. Any aircraft capable of operating over 100,000 pounds must fill out this form at least 72 hours before flying into Teterboro. The operator must seek permission and certify that the aircraft will be under 100,000 pounds throughout all operations at Teterboro. Million Air knows this is inconvenient for private jet users who expect to fly wherever they want, whenever they want. This is why they are advertising “No Weight Restrictions!” to aircraft considering Teterboro. Million Air has repeatedly claimed that their expansion serves the public and the environment by reducing the number of flights. We have previously shown that these claims are likely false. Obviously, attracting the heaviest, most polluting private jets to Westchester from Teterboro will increase the number of flights and the amount of pollution. While Million Air continues to lie to the county and the public with these claims, their advertising to their desired customers doesn’t lie. Thank you, Jonathan, for sharing this information and your efforts on everyones behalf. There’s already enough lying, self-serving and profit greed going on everywhere; no need for even more where we live Westchester does not need more noise, more pollution or more traffic. Westchester does need honesty as well as less noise and more fresh air. Thank you Jonathan for keeping us all apprised of what is going on. I just hope our county executive is as well informed and makes sure Westchester doesn’t succumb to Million Air or any other abuser . Your commitment in getting all the facts pulled together and presented to the public are commendable Johnathan. Keep up the good work…in holding accountable the airport and legislatures in keeping our air clean, our water clean and noise levels low.